Having over 35 years of experience manufacturing the most efficient and hard working incinerators in the world it is safe to say that we know what makes the right machine for you. Our Agricultural range has solutions for every farm size from our compact Mini-AB all the way up to our High Capacity range including the mammoth Rapid 1000. The Rapid 1000 is one of the largest standard incinerators available from Addfield. Ideally suited for the large-scale safe destruction of agricultural, poultry, sheep, swine and cattle. Processing up to 1000kg of waste an hour through its 5.3 cubic metre chamber capable of holding up to three and a half tonnes of waste. The Rapid benefits from the same high-quality design and manufacture as all Addfield machines. Beginning with design where the entire system is developed from the ground up utilising computational fluid dynamics alongside advanced engineering techniques to design a machine that will be as robust as it will be efficient. Constructed from 10mm thick mild steel providing insulation and strength with impact resistant ‘loading bars’ designed to withstand impact from fork lift trucks. Fitted with protective shielding across high usage areas including ram arms protecting the operational hydraulics. Having additional high visibility loading bars providing a safe zone for fork lift operation, directing the waste to be loaded into the optimal position. Keeping the transition flue clear preventing waste from creating a blockage and preventing the system entering reduction by ensuring a consistent flow of oxygen. The hydraulically powered lid is compatible with your choice of manual or automatic loading systems. The angled designed ensures that loading is handled so that waste does not fall out, with a higher back and sloping front increasing capacity effectively. Operated via a pre-configured control panel, you only need to select the required program and the Rapid will automatically manage the process safely. You also have the option of adapting and changing settings manually in the future as required. Once in operation the main chamber is heated by 7 burners, 5 located beneath the floor grate and a further 2 above in a pattern proven to deliver exceptional results. The 5 underfloor burners are assisted by the addition of a large fan rapidly circulating the oxygen throughout the machine. The grated underfloor combustion rapidly heats the air from the base converting it into powerful radiant heat quickly filling the combustion chamber with an even level of heat. This heat is then re-circulated through underfloor tubing inserting the warm air back into the radiant bricks as well as further directing the heat over and under waste maximising the efficiency of the heat energy. Combined with the advanced multi layered brick based refractory system the rapid delivers a faster and more efficient operation saving up to 40% on your running costs when compared to concrete lined systems. The dense ribbed chamber floor has been developed to allow easy heat distribution whilst aiding ash collection through directing it to the 5 core drop zones. You are able to monitor the incineration process throughout the cycle through the integration of multiple viewing ports located on the secondary and main chamber as well the deashing doors. Deashing can then be carried out through the 5 chamber doors, built along a plug design to maintain an airtight seal and aiding insulation. This option can be manual or semi-automatic with a screw feed system to remove the ash from the deposit zones. Fans circulate the heat throughout the main chamber and then into the secondary chamber where the waste gasses are heated to a minimum of 850 degrees for animals and 1100 degrees centigrade for medical eliminating smoke and odours releasing cleaned gas back into the environment. The Rapid uses layered limit switches fitted to all doors separating the burners, maintaining a constant movement of heat throughout the process as the multi levelled burners will only be switched off during loading and deashing, reducing downtime and maintaining high levels of safe operation. Keeping the incinerator at optimal temperature by only limiting burners associated to which level of door is opened. For example keeping the top burners on during de-ashing. Able to be operated as a rapid response machine in reaction to any biosecurity emergencies, the Rapid 1000 is available in two versions. The static permanent installation which is available in a range of Diesel, LPG and other fuel types. And a mobile diesel only version. Complete with many advanced safety features as standard including an emergency bypass configured to open at the same time as the door to direct energy up the stack allowing the chamber to maintain heat energy. In case of a power cut the emergency bypass will automatically open the hatch to release the gasses. Optional extras are also available such as an Air conditioning unit which will be attached to the control panel to protect electronics in high temperatures. The Rapid 1000 is a truly impressive machine designed to help you manage your waste safely, completely and economically. To learn more about the standard agricultural range click here. To learn more about our High Capacity range click here. Achieving further recognition for continuing international success on Thursday the 6th September, Managing Director Steve Lloyd joined a select number of innovative UK companies at the Manufacturing Technology Centre in Coventry to receive their latest business award. 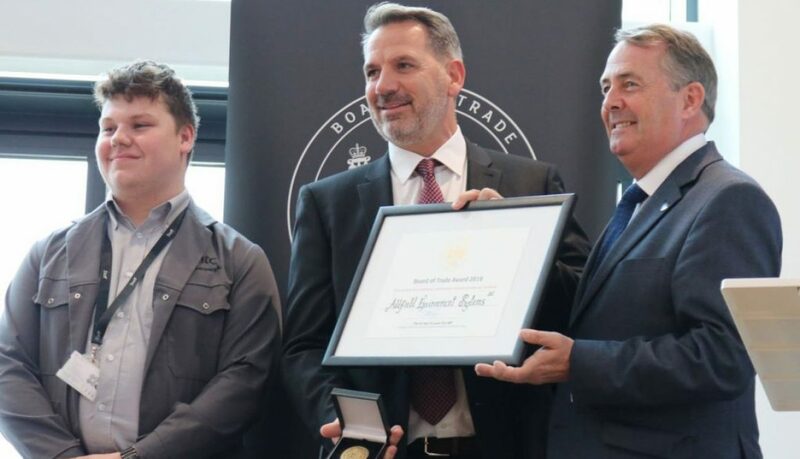 Presented by the Secretary of State for International Trade Dr Liam Fox MP after having been awarded the respected Department for International Trade, ‘Board of Trade’ award. A highly prestigious accolade, which is a genuine honour to receive. These awards are issued to businesses as a result of delivering outstanding activities on the global marketplace. Following a tremendous year of UK and International orders received. Addfield were nominated independently by the Department of International Trade and have won the award after suitably impressing the judging panel through their ongoing and significant contribution to security and stability in the UK and / or abroad, through trade and investments across their range of medical incinerators. Recognising the continued growth and innovation in the field of medical incineration of which Addfield are continuing to lead through increasing orders supplying many of the worlds leading aid agencies and government bodies internationally. “It is a real honour to have been issued this award. The past few years have seen us undergo dramatic growth based upon our expanding international reputation. Alongside the tireless hard work of the entire team at Addfield, we are proud to have seen the environmental impact that the installation of our machines has had on the communities in which they have been installed. 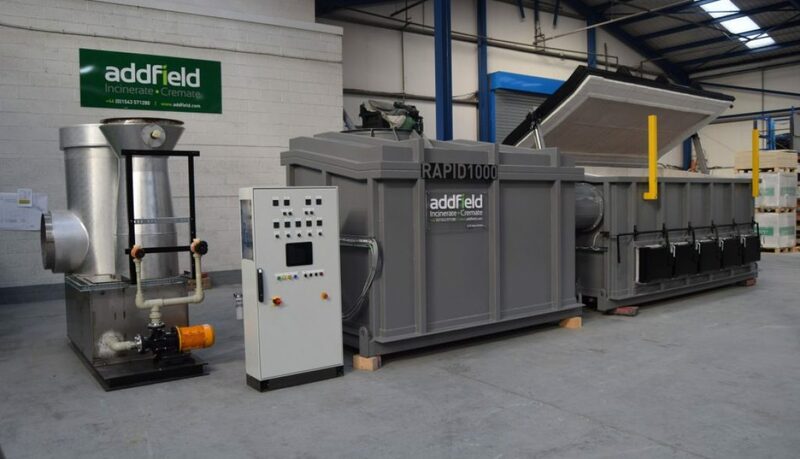 The fact that we are continuing to receive growing numbers of repeat orders is a testament to the quality of the machines which reinforces the Addfield adage ‘Simply Built Better’” – Steve Lloyd Managing Director. “My international economic department is delighted to have awarded Addfield Environmental a Board of Trade Award, recognising its exporting success. Its exceptional home-grown innovation is helping solve the problem of medical waste in markets as diverse as Mexico and Togo. The Board of Trade Awards highlight businesses that deserve special recognition for their role within their communities, showcasing successes in trade and investment across the whole of the UK, from all sectors and businesses of all shapes and sizes.” – Dr Liam Fox MP International Trade Secretary. Addfield Environmental Systems manufacture incineration and cremation solutions that are distributed worldwide. In recent years the growing global population has resulted in an increase in demand in medical incinerators to protect communities against the risks of cross contamination and viral outbreaks such as Ebola and Zika in developing countries. Providing increased biosecurity and a safe solution compared to methods previously engaged in the disposal of infectious biological, clinical and hospital waste throughout many developing countries. Supporting customers beyond the initial purchase of machines through delivering training to local engineers ensuring that not matter where in the world Addfield machines are installed there will always be an qualified engineer available. The level of sales is a corresponding result to the years of continuous improvement and development across the range of machines available which have been proven to deliver results regularly exceeding customers initial expectations. Forging strong relationships with international distributors, organisations and consulting experts. The Board of Trade awards were reconvened by current Secretary of State for International Trade Dr Liam Fox championing the work of business in delivering economic growth across the UK. Nominated as a result of the work that Addfield have carried out in partnership with the Department of International Trade and following their recent exemplary success during the past years in international expansion and their role in the community.